Xpress Your Essence: 2015: Here I Come! 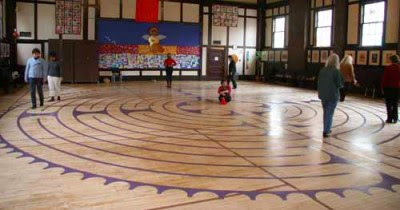 The New Year's Eve schedule is on the lower left of the church's web page: http://stpaulsanglican.bc.ca/worship/the-labyrinth-what-is-it/. The music program started at 6 pm and I arrived approximately one hour later. A man by the name of David Yates played various instruments including a flute (Native?) or two, a Swiss instrument called a hang (also known as a hang drum that looks more like a UFO, unidentified flying object also known as a flying saucer), a didj (short for didjeridu or didgeridoo), a water-sounding instrument and other wind instruments, followed by Clare Morgan on Celtic harp. Walking the labyrinth on New Year’s Eve (at this particular church) has been and probably will always will be (until things change) be a ritual that I have come to depend on and enjoy for some time now, not sure how many years. I let go of the old year and focus on the new year, setting my focus, anchoring my word or theme for the new year; see my post yesterday about this. It's been a common practice for myself and countless others who all have their agenda for the evening. For some, it might be to set and anchor in their intention(s) of 2015 just around the corner. For others, it may be a way to reconnect with folk who may be absent from various community and social events, like myself as I usually attend ones in North Vancouver. And for others, it may be one of a few nonalcoholic events or a precursor to a party sans alcohol or not. Whatever the reason, it is a soft and gentle way to end the old year and beckon in the new. It is a quieter, more reflective type evening and especially great for introverts. Even though most people who walk the labyrinth look downwards, I make a point at making eye contact when passing by others, and smiling. Sometimes, it seems a more somber affair with downcast faces towards the floor. How do or did you celebrate New Year's? And how do you usher in the new year: do you have a New Year's ritual? Sorry to hear about your plantar fascitis, Elly... Hope you find a lasting healing soon, and hope this year turns out to be as peaceful and loving as you and your annual new year ritual are :) by the way, the name Zamir Dhamji sounds familiar... Have you mentioned him earlier? Or is he anyhow connected to any popular media? Wish you a very Happy and Healthy New Year, Elly.